Did Dan make a decision that could end D.J. 's career? 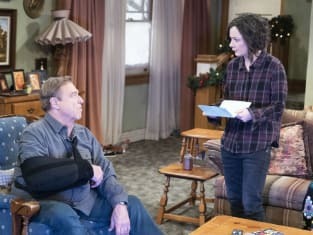 On The Conners Season 1 Episode 9 the Conner family patriarch was injured on the job covering his son's vending machine route and had to decide whether to sue the company. Meanwhile, Jackie was appalled when Lecy sought life coaching from Rita Silver. Did Jackie manage to talk Lecy out of speaking to the elusive enemy?